TOBI was hauled back on deck today after a mission lasting three and a half days and covering more than 600 km. We now have superb images of the seafloor to help us plan the next stages of our work. The video below shows our new map of Mount Dent, an underwater mountain halfway along the ridge we are investigating, and whose formation our geologists are hoping to understand (please see our Geology pages for further details). Mount Dent is twice as high as Ben Nevis, the highest mountain in the UK, and yet its summit still lies one-and-a-half miles beneath the waves. The 'warmer' colours in the video show areas that are at shallower depths. The red area shown on the 3D map is approximately 20 miles across. We have now sent the CTD probe down towards the seafloor again, carrying two pieces of equipment for testing at depth. 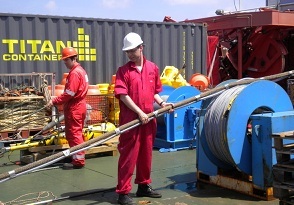 We need to test our set of acoustic releases, which are devices that let go of instruments held at depth when they receive a sound signal from the ship. We are also testing a compact underwater navigation beacon that will be used on Autosub6000 when it is launched, and which couldn't be tested deeper than 4500 metres before now. Our research in the deep ocean depends on technology, and looking after that technology is the responsibility of the team of engineers from Sea Systems, a division of the UK National Oceanography Centre. The Sea Systems team join the ship early to unpack and assemble the equipment before the beginning of the expedition, and stay on at the end, preparing the equipment for transport back to the UK. So aboard the ship we have several teams of people, all pulling together towards our common goal of scientific exploration. There are the ship's officers and crew who run the vessel, the Sea Systems and Autosub6000 engineers who look after the equipment and underwater vehicles, and the scientists. Planning for an expedition like ours begins a year in advance, with members of these teams meeting to agree all the equipment and technology that will be needed. This may include designing and developing new tools. For example, if the science team want to use Autosub6000 to take pictures of the seafloor, then the engineers will plan, design and test new underwater cameras. Such developments are not trivial: adding a camera to Autosub6000, for example, means integrating new software, testing for electrical robustness (as water and electricity do not mix well! ), and balancing the added weight of the camera to 'trim' the vehicle so that it does not nose-dive. As we approach the launch time for our first Autosub6000 mission, it's an anxious time for the engineering team making their final preparations.